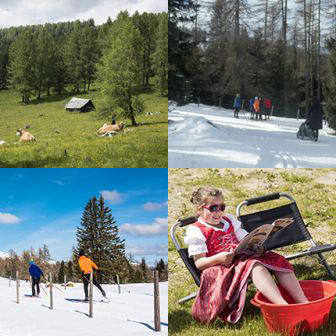 In the Summer we offer a great “Adventure World” especially for children where they can learn a lot about the surrounding nature and experience the Alpine meadows with all the senses. 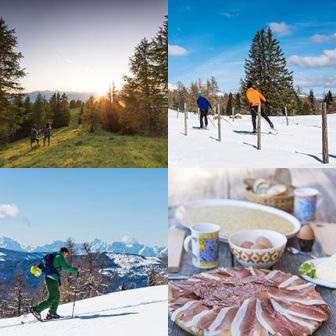 They can visit “King Waldgeist” (a forest fairytale landscape), the fun and exciting Hiasl-Almmatura (experience every day life and work in the mountains and receive a “certificate” at the end) or the “Zirbenzapfi Adventure Trail” (experience nature in the Swiss stone pine forest). We have put together a range of attractive offers for all of our guests, including hiking trails of various lengths and degrees of difficulty, sports possibilities nearby (running, golf, swimming ...) as well as excursions - your hosts will give you valuable tips. 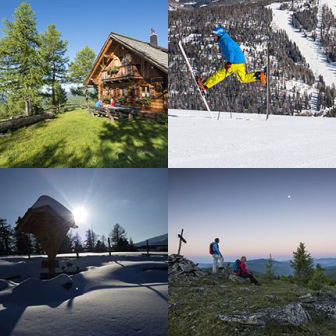 The family-friendly ski resort has 7 lifts, 20 km of perfectly groomed slopes, 23 km of cross-country trails in a panoramic area, miles of floodlit toboggan runs, sleigh rides, curling and much more. Young and old can learn to ski or snowboard or improve their skiing or snowboarding skills at the ski school. (It is possible to rent skis). Winter and snow shoe hikes in the moonlight are equally sought after attractions! 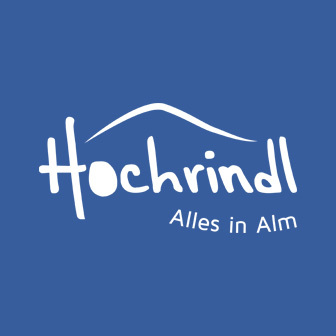 The Hochrindl can either be reached by car or you can easily travel by public transport. We can pick you up by shuttle from the train station or airport and take you to your accommodation. There are a number of tourist accommodation as well as private room rental companies. There is also a mini market with a farmer's corner, where you can get everything you need, from food, fresh pastries, newspapers, souvenirs to farm products, which makes your stay more pleasant. In winter there are many parking spaces at the base stations of the lifts. Many of the lodgings have direct access to the slopes! Comfort is very important to us - from the alpine hut, to the restaurant! 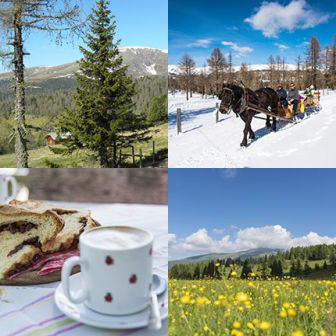 Enjoy the culinary diversity of Carinthia. Our home-cooked food is incredibly creative and popular with guests. Innovative Innkeepers conjure the taste of the region onto your plate. Those who prefer international cuisine, will find an equally plentiful offer! You have the possibility to contact the accommodation directly or use the booking form on the home page. Select the type of accommodation and enter your travel dates, number of persons and desired category. You will receive the corresponding offers for your holiday by mail and can then plan your holiday right away. 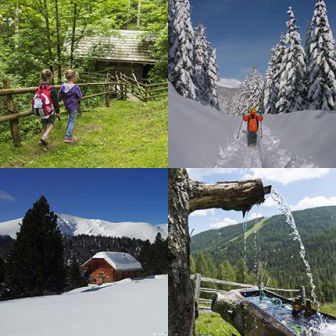 There is a choice of Hotels, Alpine Cabins, Holiday Homes, Apartments, Farms, Inns or Guest Houses.